A successful refit combines traditional shipbuilding skills with a knack for problem solving that only comes with experience. The scope of work nearly always expands as the project progresses, so the many variables have to be calculated while keeping a close eye on budgets and production schedules. 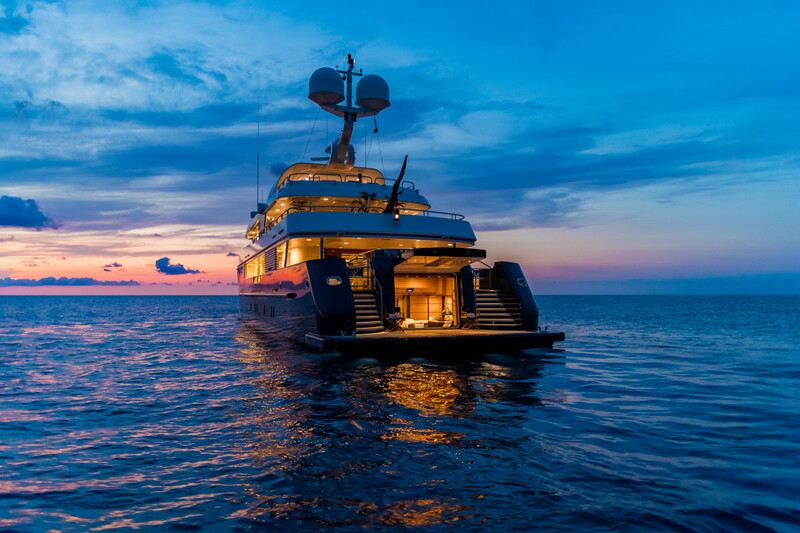 It was with this in mind that Imperial—the Monaco-based management, new construction, sales and charter company—turned to Amico & Co. for the refit of Kiss the Sky. 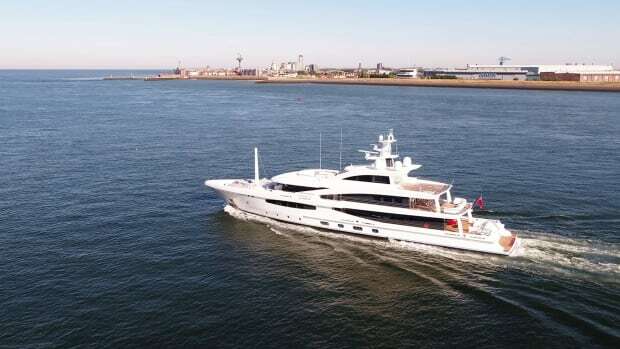 Designed by Terence Disdale and launched by Amels in 2001, the 170-foot, 7-inch (52-meter) yacht had been put through her 15-year Lloyd’s survey in the United States and was for sale. 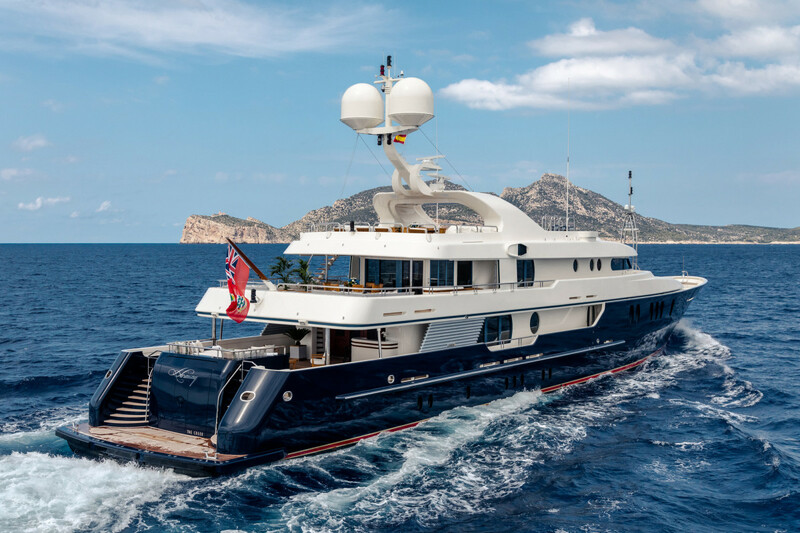 On the outside, her dark blue hull and white superstructure were still contemporary, but the Patrick Knowles interior design dated to a 2009 refit. 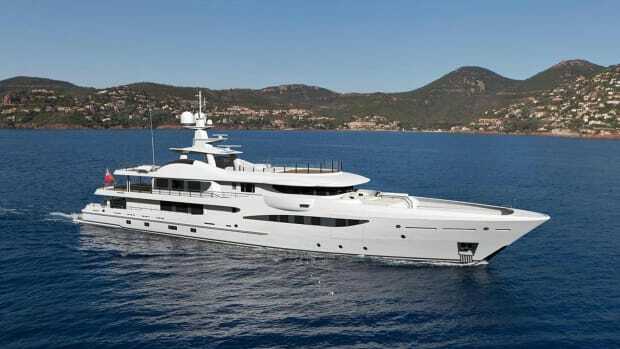 M/Y Kiss the Sky comes out of the water at the Amico & Co. yard in Genoa, Italy. 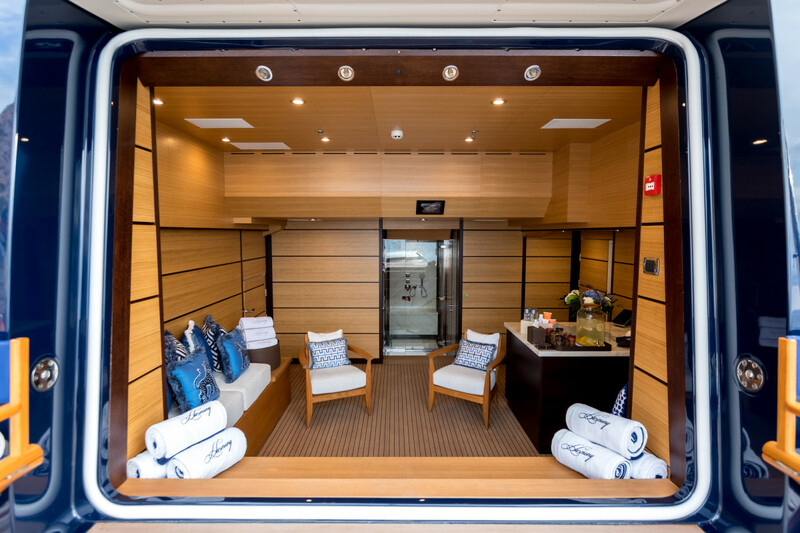 For an interior revamp, Imperial could have gone to any number of yards, but the client also wanted to enhance the functionality of the yacht by transforming the lazarette into a spa and beach club with steam room, shower, bar and lounge. This was a much more challenging proposition that required adding around 9 feet to the stern, increasing the overall length to just over 180 feet (55 meters). 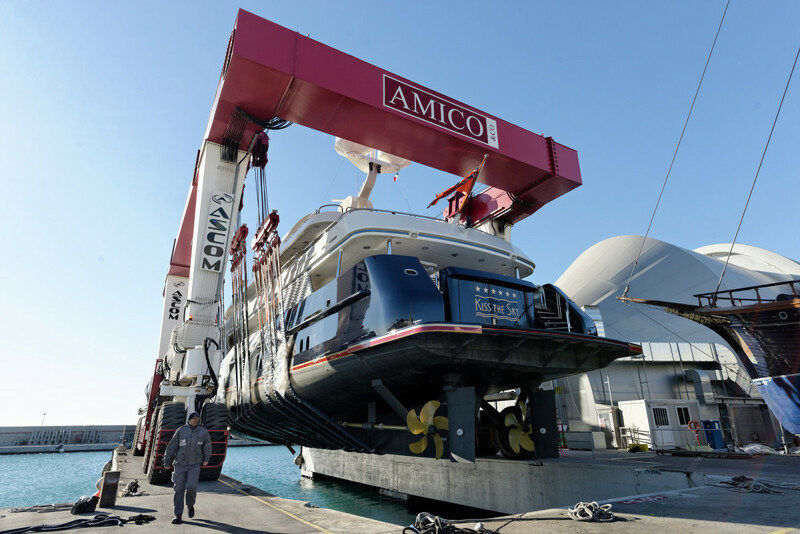 Amico & Co. specializes in complex engineering works, which is one reason the yacht was transported to Italy. 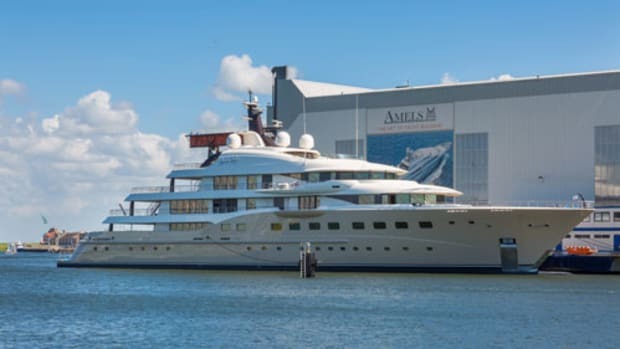 Aware of the tight schedule, Amico & Co. dispatched a team to Florida to conduct a feasibility study before the client had signed the refit contract. 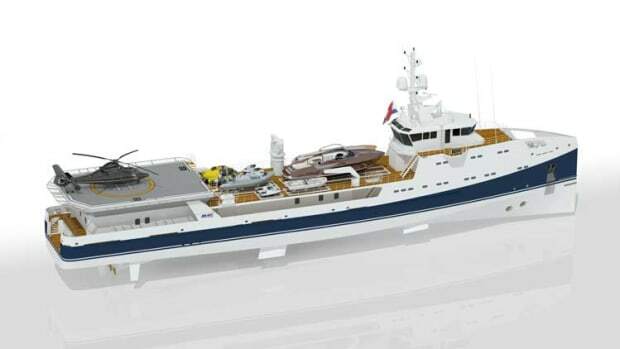 When the yacht arrived in Genoa in late December 2016, her hull was 3-D-scanned, and the technical office began the naval architecture and stability calculations for the longer waterline length. A noise and vibration analysis was also carried out to avoid cavitation that might result from the new hull shape. Kiss the Sky, pre-extension of her after section. Harmony&apos;s extended after section is clearly visible when compared with Kiss the Sky (top photo). 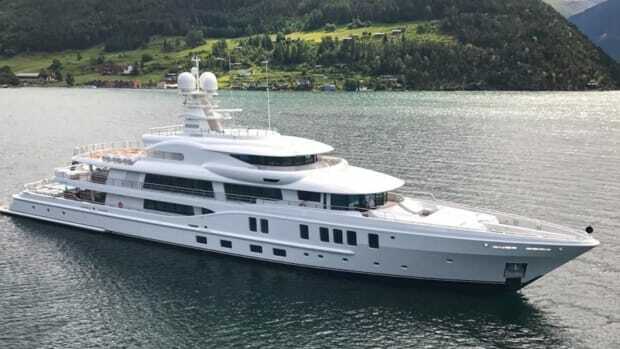 Now named Harmony, the yacht’s first stage of the refit began with cutting the steel hull just abaft the propellers, which had to be dismounted along with the drive shafts. A new 18-foot (5.5-meter) block was then welded into place. To avoid a complete hull repaint, this new section had to match the existing dark blue livery seamlessly. The original lazarette was transformed into a fully appointed spa and beach club (below). 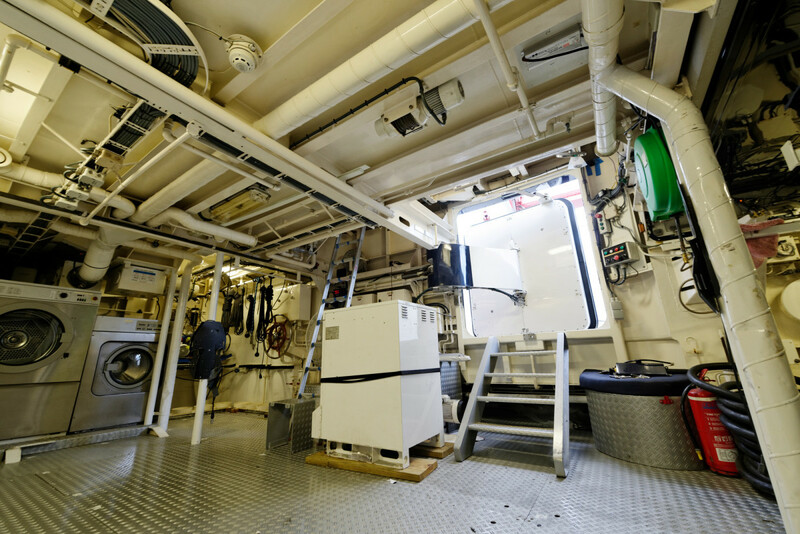 The engine room machinery was in perfect working order and only the generators were replaced with new John Deere units. But a tiller arm connecting the two rudders in the old lazarette had to be re-engineered so it could be integrated out of sight into the teak-lined beach club. 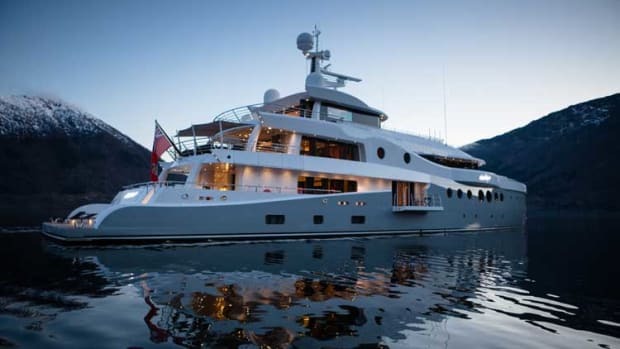 In addition, the sun loungers on the deck immediately above were raised onto a platform to provide the requested headroom and space for a larger transom door. Luca Dini Design was engaged for the interior restyling. Taking care to retain as much of the existing joinery as possible, the studio created mood boards to reimagine and refresh the décor. 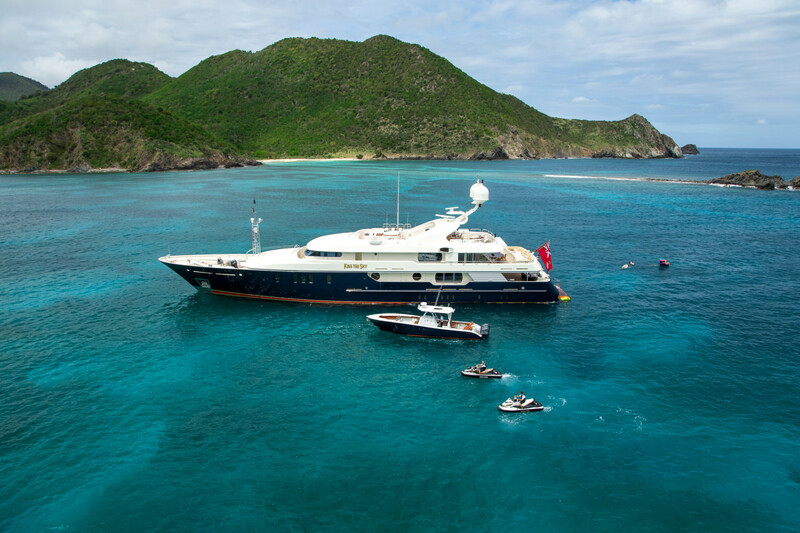 Having collaborated with the owner on previous yacht projects, Dini had some idea of his tastes. 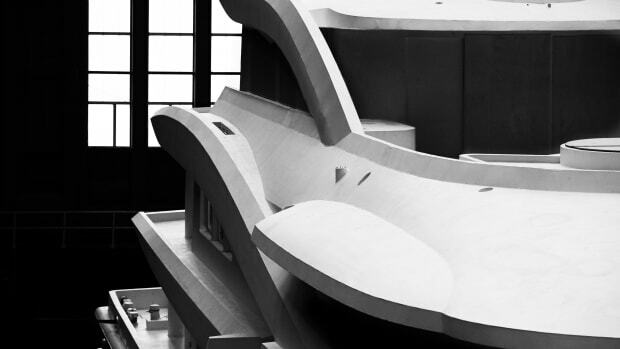 But the delicate interior work had to start while Amico & Co. was still engaged in the grimy job of extending the hull and gutting the lazarette. The freestanding furniture in the main and upper deck lounges was upgraded and upholstered with custom fabrics in crisp shades of blue, white and gray. The removal of a fire door in the main salon opened the floor space and added to the sense of airiness and light. 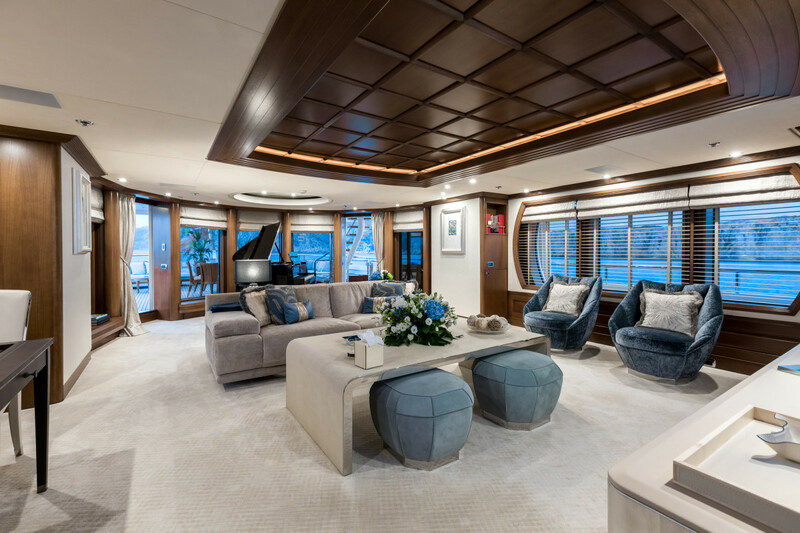 Coupled with new Tai Ping carpets and accessories from Italian designer brands such as Baldi, Fendi, Visionnaire and Giorgetti, the furniture, fabrics and space have a gently masculine style with a hint of nautical tradition. Existing oak cabinetry and other core materials were revarnished to harmonize with new finishes in translucent onyx, shimmering gold leaf and natural leather. All the halogen lights were replaced with more energy-efficient LED units and fixtures that could be fitted without having to drill new holes in the overheads. 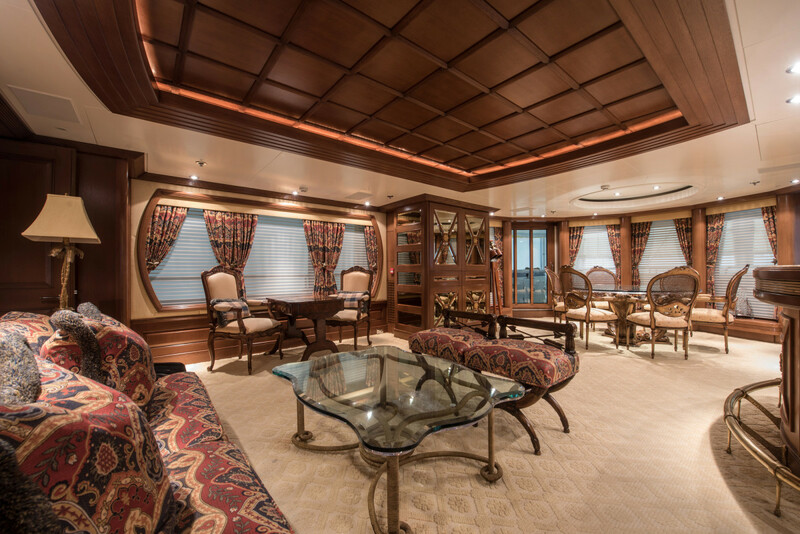 All the fabrics were changed in the four guest staterooms and full-beam owner’s suite, together with the bedheads, surface treatments and closets. Marble panels in the bathrooms were also replaced, while gold-finished spouts and door handles were rechromed with a contemporary nickel finish. This replace-and-preserve process also extended to the exterior decks, where the fitted furniture had old-fashioned teak moldings around its base. If the moldings had been removed, unsightly halo marks would show in the decking, so they underwent modern color treatments instead. On the bridge deck, a bar and TV were stripped out and substituted with a piano. 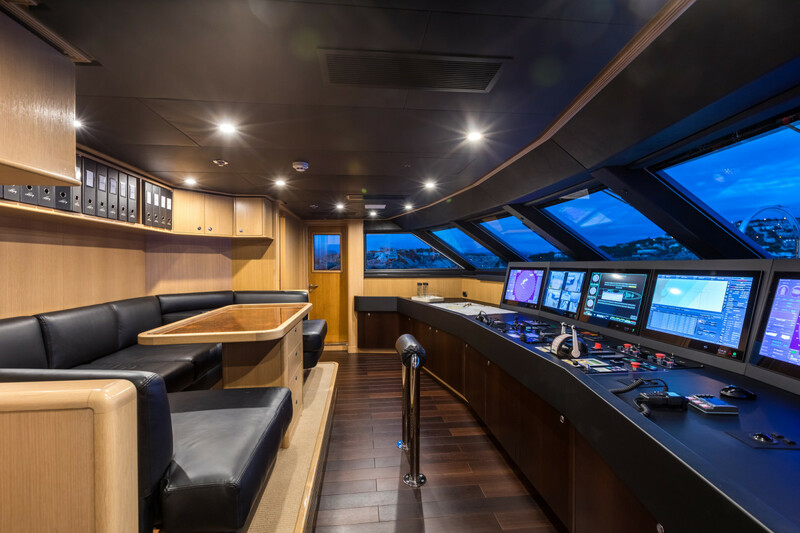 The layout was rearranged so the space could double as a cinema, and the yacht’s audiovisual system was replaced with the latest equipment. Larger TV screens were installed inside and out, including a 65-inch screen in the beach club. 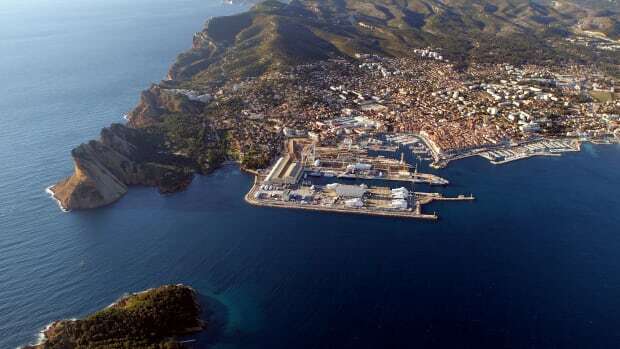 Crew and service areas also underwent extensive refurbishing. The galley was replaced and its functionality improved with fitted cabinets, high-end appliances and new worktops. 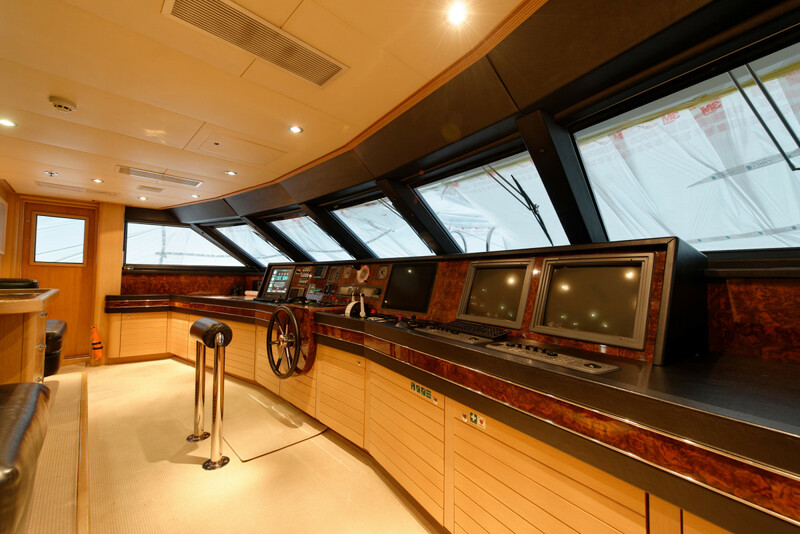 The wheelhouse also was upgraded in line with the rest of the interior, and a Telemar integrated navigation system was installed. 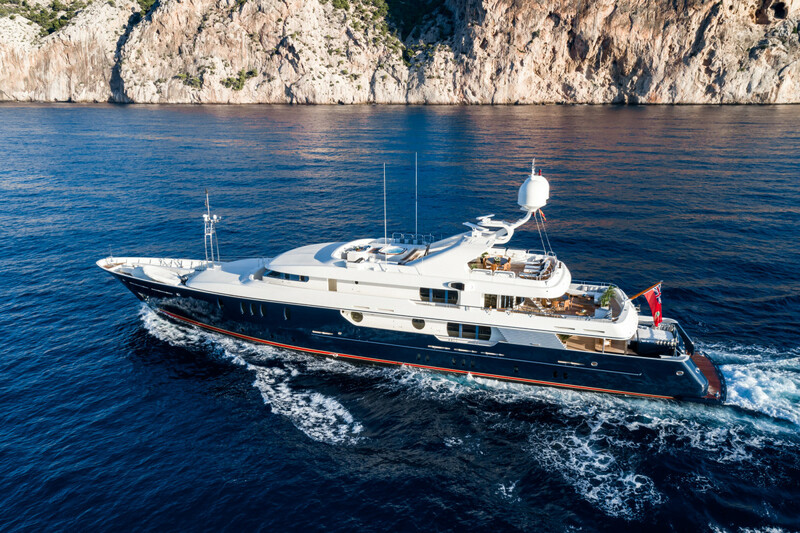 Harmony is an elegant example of how a well-managed refit can enhance an aging yacht’s livability, boost her charter potential and raise her resale value. Arguably the centerpiece of the whole transformation is her new spa and beach club. 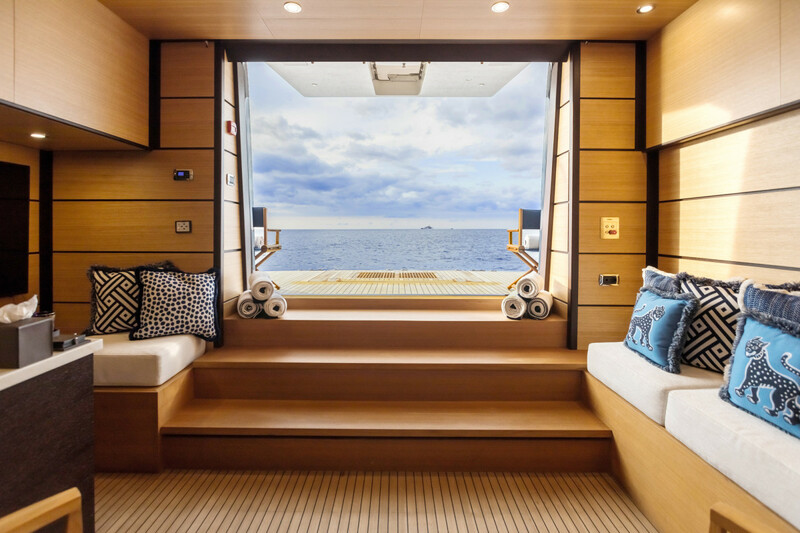 With its lofty ceiling, breezy access to the aft platform and vibrant fabrics from Thibaut’s Calypso collection, the space is—quite literally—a breath of fresh sea air.